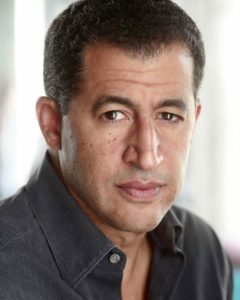 Lawyer turned actor, Amr El-Bayoumi sat down with Press Pass LA to discuss his mission to combat Arab stereotypes on camera, and his career including roles across Tom Hanks in Captain Phillips. After spending twenty years in corporate law, career burnout and a lingering passion for theater found Amr El-Bayoumi making the scary decision to change his path and pursue acting. In only four short years, he’s booked major roles across actors like Tom Hanks in Captain Phillips, Alan Alda and David Strathaim in The Blacklist, Tim Daly in Madam Secretary and more! Plus, he’s working to change the way Arabs are pictured on screen. PPLA: When did you first know you wanted to pursue acting? AMR: In the 3rd Grade at Bailey Elementary School in East Lansing, Michigan when I directed the Wizard of Oz. However, my pursuit was delayed for a long time by my studying engineering in college instead of majoring in theater (practicality first), then wanting to be a human rights lawyer. After graduating law school, I was strapped with over $150,000 in debt, so human rights law (let alone theater) went out the window, and I ended up trotting the globe as an international corporate lawyer for 20 years to pay off my debt. I did manage to fit in some pro bono work, and maintained my passion for the arts by writing and directing a short documentary film and a short fiction film during that period. After saving up and burning out on the corporate world, I found myself in London where I decided to study acting at the Actors Centre and the Central School of Speech & Drama. Since then, I’ve been working in film, TV, theater and voice over projects for the past 4 years. PPLA: What was the experience like when you first arrived in Hollywood? AMR: My initial experience in Hollywood was when I was assigned to L.A. as a chemical engineer right out of college in the late 80’s. I went for small roles on the side, and soon realized that the vast majority of roles for an Egyptian-American actor were (and remain significantly) limited to the ugly stereotype of the Arab terrorist. That experience led me to publish an article about stereotypes in film and TV, “Amr Goes to Hollywood,” which was recounted in the book Reel Bad Arabs: How Hollywood Villifies a People by Jack Shaheen When I rekindled my interest in acting many years later, I decided to avoid stereotypical roles that denigrated Arabs. Although this has limited many opportunities in my new career, I am happy to uphold this standard. Only ignorance can result from perpetuating a one-dimensional stereotype and dehumanizing a people, regardless of race, religion or sexual preference. I regularly speak about this issue, including participating in a recent SAG-AFTRA panel discussion on Arab and South Asian stereotypes. PPLA: Was there a moment in your career where you felt like you’ve made it or at least felt encouraged you were on the right path? Perhaps booking your role on the TV show Mr. Robot? AMR: My pursuit of acting was never to obtain “fame and fortune”, but to be a part of a wonderful art form that allows one to share truth and honesty with others. My favorite moments in acting have not necessarily involved working in big productions with big names, but getting to a point of letting go in a role so that it feels second nature. That and making a connection with an audience at a basic level are important. So it could happen in a workshop while performing a scene or taking a spontaneous risk during a short, independent film shoot. Sure, it was exciting to work with wonderfully talented actors, directors and crew on big productions, but this standard of connecting with my character and others is what has driven me to pursue acting. Most importantly, I seek to continuously grow as an actor and a person. Also, it was special to me as an Egyptian-American to be a guest star on Mr. Robot, a show where both the creator and the lead actor, Rami Malek, are also Egyptian-American. PPLA: What was it like working with Tom Hanks on Captain Phillips? AMR: No surprises here. The Captain Phillips role came within a month of my decision to pursue acting full time. What a wonderful experience! Just a few weeks after sitting in a board room on a conference call concerning a multi-million dollar transaction, I found myself on the set in Malta working with the legendary Tom Hanks, director Paul Greengrass and cinematographer Barry Ackroyd. It was a thrill, and Tom Hanks was the decent, wonderfully talented gentleman that you would expect. The reality and honesty that we all witness in his characters was equally there during breaks between shooting. No ego, simply genuine and inspirational. PPLA: Was there a moment or instance in your career where you almost gave up and what kept you going? AMR: Of course, choosing a career as challenging as acting with all it’s rejection and uncertainty (especially after a successful career in law) entails many moments of doubt – as in ‘what the hell do I think I’m doing?’, but what keeps me motivated is that I am satisfied performing in a play in front of just 20 people. For me, it’s not about any specific end point or credit or the scale of a particular project, but the process as an art form. That is why I constantly try to ‘stay in shape’ by participating in workshops, attending theater performances and movies, reading and supporting my fellow artists in their own pursuits, especially during leaner times. PPLA: You recently worked on House of Cards. Tell us about that role. AMR: I recently performed in an episode of House of Cards as a Washington lobbyist holding a news conference on Capitol Hill denouncing anti-Muslim hatred. It was a very important monologue, and served as an antithesis to the standard Arab/Muslim stereotype. What I admired most about the producers and writer is that the scene was not essential to the plot, but was included anyway to reflect a rarely presented perspective. PPLA: We always love to know what an actor’s very first booking was, do you mind sharing yours? AMR: A non-speaking role in a BBC music video, which served as a good lesson. Perhaps it was my previous career experience as an engineer and a lawyer, but I saw no difference in acting as a profession compared to any other profession. Like any other job, one should show up on time, follow direction, and be open-minded, generous, courteous and professional with everyone (cast and crew) in the production no matter how ‘small’ the role, even though some people may be more casual with there professionalism in ‘the arts’. Apparently the producer of the music video noticed this in me, and indicated that he would like to work with me in the future. Six months later he cast me as a lead in a one-hour crime re-enactment show on prime time TV in London. PPLA: Where can we catch you next? AMR: I have recently completed roles in various independent short films that will be hitting the international film festival circuit. I will be performing in a few staged readings of plays in development. I am crossing my fingers for some previous roles to go recurring, and am glad to not know exactly what’s coming up next – that’s the enjoyment for me! PPLA: When you look to the future, what actors or directors would you love to collaborate with? AMR: There are so many amazing artists out there, but if I had to select a few dream collaborations it would be Tom Hardy- any artist that can keep you riveted in a movie that occurs in an SUV, as he did in Locke, is fascinating to me! Michael Fassbender, Helen Mirren, Denzel Washington and Tom Hanks. As for directors, Paul Greengrass, Park Chan-wook, Mira Nair and Paolo Sorrentino. Thing you must have at your audition: A clear head, and, as Bryan Cranston stated so concisely in a recent interview, the notion that I am not there to ‘get the part’, but to share my art, be true to the piece and then leave it in the room as there are so many factors that go into a casting decision that the actor does not control. Go-to Fashion Item for a big audition or meeting: My blue Groc blazer that I bought in Barcelona and my two-tone brown and white wing tips à la Kramer in Seinfeld. FAV TV show right now: Black Mirror, a profound commentary on how advancing technology impacts us all socially. FAV movie: Of all time, The Godfather. This Year, The Handmaiden, directed by Park Chan-wook. Hidden Talents or Fun Fact about you: Horse riding, cooking and an acute love of Ireland.